Semtech Corporation (Nasdaq: SMTC), a leading supplier of analog and mixed-signal semiconductors, announced that it has joined Panasonic, a premier supplier of imaging technology for the broadcast and production industries, in a collaborative effort to develop Panasonic’s next generation family of UHDTV products utilizing Semtech’s portfolio of advanced 12G UHD-SDI products. 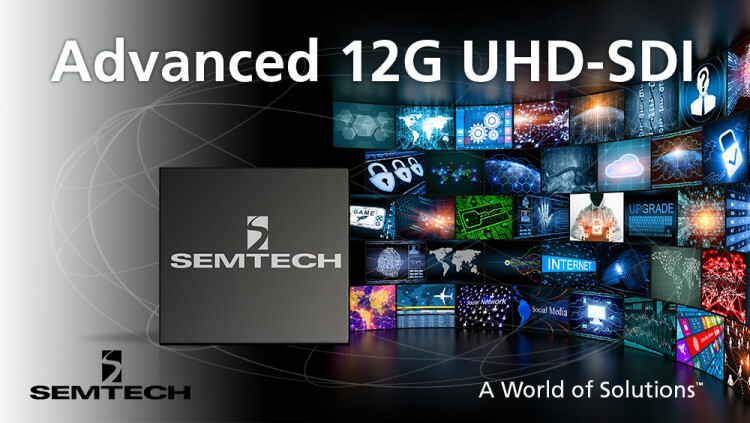 Semtech’s comprehensive portfolio of 12G UHD-SDI products includes the 12G GS12141 retiming equalizer, the GS12181 retiming cable driver and the GS12070 UHD-SDI Gearbox, which will be showcased at Semtech’s booth N5024 at the National Association of Broadcasters (NAB) Show on April 18-21 at the Las Vegas Convention Center. In addition, at the NAB show, Panasonic will feature a UHD-SDI interoperability demonstration using Semtech’s 12G GS12141, GS12181 and GS12070 in conjunction with a Panasonic Studio Camera and Switcher. The GS12070 is a revolutionary integrated circuit that enables seamless conversion between multi-link, dual-link and single-link UHD-SDI interfaces at HD, 3G, 6G and 12G line rates. The GS12141 retiming cable equalizer and GS12181 retiming cable driver establish new industry benchmarks for performance with their advanced feature sets and are the preferred interfaces for next generation UHDTV equipment and infrastructure. UHD-SDI is the only standardized broadcast UHDTV format, and the GS12070, GS12141 and GS12181 empower equipment manufacturers and broadcasters to take a standards-based, commercial off-the-shelf approach to UHDTV infrastructures. Semtech’s UHD-SDI products feature ultra-low power consumption and provide industry-leading performance at 12Gbps rates. UHD-SDI is ideal for UHDTV infrastructures, including routers, cameras, monitors, switchers and more. It offers pristine image quality, is backwards compatible with existing SDI systems, and is standardized by both the Society of Motion Picture & Television Engineers (SMPTE) and the International Telecommunication Union (ITU), simplifying UHDTV infrastructure upgrades and reducing risk for broadcasters. All statements contained herein that are not statements of historical fact, including statements that use the words “enable,” “will,” “provide” and “offers” or other similar words or expressions, that describe Semtech Corporation’s or its management’s future plans, objectives or goals are “forward-looking statements” and are made pursuant to the Safe-Harbor provisions of the Private Securities Litigation Reform Act of 1995, as amended. Such forward-looking statements involve known and unknown risks, uncertainties and other factors that could cause the actual results of Semtech Corporation to be materially different from the historical results and/or from any future results or outcomes expressed or implied by such forward-looking statements. Such factors are further addressed in Semtech Corporation’s annual and quarterly reports, and in other documents or reports, filed with the Securities and Exchange Commission (www.sec.gov) including, without limitation, information under the captions “Management's Discussion and Analysis of Financial Condition and Results of Operations” and “Risk Factors”. Semtech Corporation assumes no obligation to update any forward-looking statements in order to reflect events or circumstances that may arise after the date of this release, except as required by law.